First, finale. – Dirty wet dog , boats and sailing. The absolutely last word on starter boats for now. Writing about boats for beginner sailors or for sailors contemplating buying their own first boat has been a fascinating exercise but even i know that i haven’t told the full story. I have only begun to scratch the surface by taking the concept of working to a small budget and inevitably searching for smaller and older boats. I hope that readers will see that i have tried to pick out boats that have a reasonable chance of not having major problems to sort out and are relatively straightforward to get on the water. All i have really done in my own boat searches is use 3 principal websites : Apolloduck, EBay and then specific example owner websites eg the Corribee association. If a particular boat appeals then there is often a users group or active web association to refer to and often someone to throw a question out to. Ebay is pretty quiet at this time of year for boats, just 3 pages compared with frequently 5 for sailing boats. There were less small boats around on other brokerages and i simply gave up using boatshed when search after search on a specific boat on that site would come up with “this boat is sold but here are 10 other completely unrelated boats” ie completely unhelpful and i wish they would stop doing that. I had thought to just do what i used to do and go poking around the back row of the more basic boatyards with my camera and see what has a ‘for sale’ notice on it. A few months ago i did that at the other boatyard where my boat is now and had to deal with a stroppy and suspicious yard boss !. On a good day in winter and early spring it’s not a bad idea though in most friendly boatyards, and most are, just to go and ask if there are any small boats for sale. Sometimes there will be a noticeboard and somebody just advertising a boat for sale locally just as is the case with my local yard . The boat that i have ended up with in my own sailing is i believe a very good example of a starter boat and i happen to think that there is some value in the idea that this size of boat might represent the ‘perfect’ small boat, the idea has been kicked around. For me the boat became ‘in-budget’ when i saved a bit more cash for the project and then needed very little cash input to get on the water. 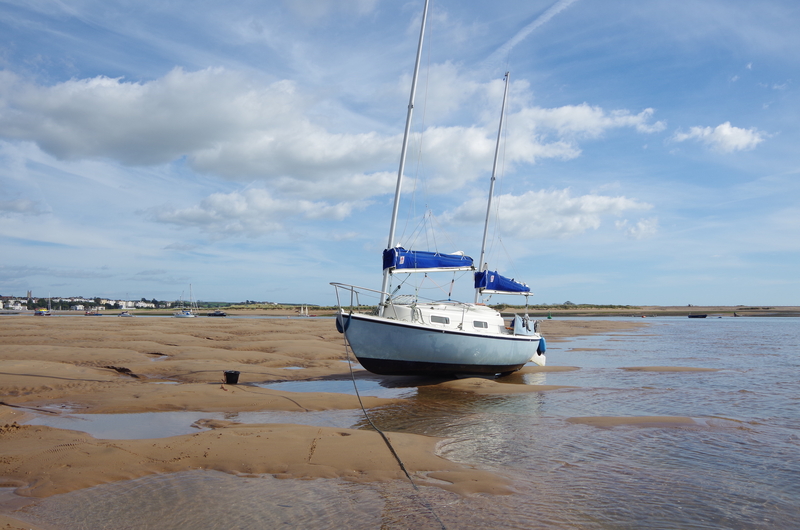 In fact i picked her up off a mooring and we left harbour with all our gear aboard just an hour later !….ok so it took a few days to get her sailing properly and then a week of work at home on the hardstanding but those were all minor problems. My insurance is now due and i know that soon i will have to pay for the second half of my winter berthing but even those aren’t huge costs at this size. This is perhaps then the major thing for the new boater to contemplate ie what do the costs and problems look like a couple of years down the line ?. This year WABI”’ really needs to come ashore for some attention as she has been in continuous service since i bought her and i know she has done more miles in my ownership than in her previous 10 years. This year the Liberty will cost me a bit more to run after i have paid for insurance and winter berthing. I will most likely have to bring her back to my home yard for a lift out and i have a short list of essential jobs to do and some things that i think would be of benefit at her age. With this writing project i have had the enjoyment of studying other small boats and it is inevitable that i wonder if a different small boat might still work slightly better than the Liberty. I’m not the kind of sailor who gets stuck on one boat and i can see that other boats that i have covered work work as well if not better so there is the possibility that i might be taking my own advice and looking for a different boat myself. Its likely that i will be selling the Dayboat on as a project before i mess it about and that would create a starting budget. Liberty’s usually sell quickly in good order and mine is basically i good shape and just needs a wash and polish so change all round might be the way of things this year. If i can solve the mooring problem ie talk the excellent yard boss to allocate me a parish mooring when they are laid then that would solve the greatest long term cost problem and i wouldn’t have to worry so much about the running costs. Any boat that fits my requirements and will live on a tidal/drying mooring would then be viable. My final thoughts are that there is no such thing as a perfect boat, only some good compromises and that it would be a lot of fun just to do the actual search for myself and go kicking keels in boatyards and do this project for real. I hope you guys have enjoyed this series as much as i have . Next Lives of great men. Very much enjoyed the series — thanks Steve. Good luck selling the Dayboat and I hope that you find what you’re looking for. That’s a song isn’t it ?